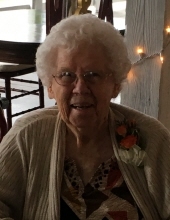 Mary Ramsey Davis, 91, of Collinsville, VA passed away on Friday, April 5, 2019. She was born on June 28, 1927 to the late James Henry Ramsey and Mary Alice Davis Ramsey. In addition to her parents, she was preceded in death by her husband, Arthur Eldred Davis; son, Eldred Davis; brothers, James, Charlie, Lewis, Sterling, Ed, Harold, Pete, and Glen Ramsey; and sister, Ethel Hodges. Mrs. Davis worked as a homemaker and was a member of Fort Trial Baptist Church where she was a member of the WMU. She was also a member of the Oak Level Ruritan Club Ladies Auxiliary. She is survived by her two daughters, Shelia Ebbert of Collinsville, VA and Jennifer Nichols and husband Todd of Martinsville, VA; two sons, Jeff and Jane Ann Davis of Bassett, VA and Phillip and Paula Davis of Bassett, VA; daughter-in-law, Teresa Davis of Bassett, VA; sister, Josephine Ramsey Horsley of Bassett, VA; grandchildren, Gene Ebbert, Lori Beth Davis, Jonathan Ebbert, Kasey Davis, Amber Moore, Corey Davis, Caleb Davis, and Brooklin Davis. Also surviving are five great-grandchildren. A funeral service will be held at 2:30 p.m. on Sunday, April 7, 2019 at Fort Trial Baptist Church with Dr. Joey McNeill officiating. Visitation will be from 1:00 p.m. to 2:30 p.m. prior to the service at the church and other times at the home of Mrs. Davis’ son, Phillip Davis. Burial will be at Roselawn Burial Park. In lieu of flowers, memorial donations may be made to Fort Trial Baptist Church, 170 Oak Level Road, Stanleytown, VA 24168. Norris Funeral Services, Inc. and Crematory of Martinsville, VA is serving the Davis family. Online condolences may be made at www.norrisfuneral.com. To send flowers or a remembrance gift to the family of Mary Ramsey Davis, please visit our Tribute Store. Other times at the home of Mrs. Davis’ son, Phillip Davis. "Email Address" would like to share the life celebration of Mary Ramsey Davis. Click on the "link" to go to share a favorite memory or leave a condolence message for the family.